I am facing blank screen issue when I connect to Windows 2012 or Windows 2016 server. I am running vnc in service mode. In user mode, as long as Windows RDP session is active then only I can use VNC. The moment I close or minimize RDP session the VNC session does not respond to any input. If I try to connect in service mode, I see only a blank black screen and does not respond to any user input. Is this a known issue? I have tried installing ultravnc 32-bit and 64-bit both one after another. I have attached snapshot of the vnc server settings. Please help resolve. This is how it works in user mode. 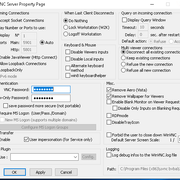 vnc clone the RDP buffer, but RDP disable his video buffer on minimize or disconnect. It should work as service. In that case you clone the real video card and console monitor. You can also play with this option. It could also that your system doesn't detect any monitor to clone, if no console exist vnc can't clone it. Most video cards support an overwrite to tell a monitor is connected, even when not plugged. I am facing this issue on Google cloud VPS. I am not sure whether this is the root cause for the problem as its a cloud VM. Any inputs on that front?